If you’re involved in the waste management industry in any capacity, you likely understand the importance of precision scales. The waste management industry must use highly accurate industrial scales to balance the importance of efficient collection, with compliance to a variety of safety, health and environmental regulations. In addition, since many waste management companies are paid in terms of the weight of the waste that they pickup, precise weight readings help ensure accurate billing. Aside from accuracy, waste management scales must also be extremely durable to stand up to the potentially hazardous environments that are common in this industry. This is especially true in the commercial waste industry where the risk of health risks and contamination is high due to risks from overloading, as well as improper waste storage. Why Partner with Arlyn Scales? If you’re looking for a scale manufacturer with ample experience in the waste management industry, Arlyn Scales should be the first company you call. At Arlyn Scales, we’ve been building scales that can hold up to the rigors of the waste management industry for more than 30 years. It’s our job to produce high quality scales that can stand up to the most taxing industrial environments, at prices that our customers can afford. There are a number of reasons why we’re able to offer our scales at such competitive prices. S. Based Manufacturing – Arlyn Scales is headquartered in Long Island, New York, allowing us to design and build all of our scales right here in the USA. This gives us countless advantages over our competitors, who largely manufacture their scales overseas. Handling all of our scale design and manufacturing in-house allows us to cut down significantly on overhead that’s common with some of our competitors. In addition, we’re able to minimize the number of quality control issues with our scales due to having our design and manufacturing teams working side by side at all times. Factory Direct Business Model – Another benefit that helps us to keep our scale costs down is by selling our products direct to our customers. This factory direct approach ensures that there are no middlemen or distributors that add significant markups on to the price of our scales. By buying from Arlyn Scales you’re getting a high quality industrial scale at a competitive price because of this unique factory direct business model. If you’re looking for the best waste management scale for your business, Arlyn Scales has developed our Arlyn 5200 Floor Scales that are able to stand up to the rigors required in the waste management industry. 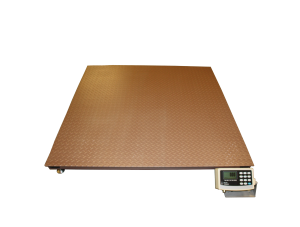 This scale is designed with a 30,000 capacity and is extremely user friendly, even in the most rigorous environments. This scale also features extremely high quality components, to ensure that it will last, and maintain its accuracy throughout its useful life. Zinc Rich Epoxy Coating—Our steel floor scales offer a zinc rich epoxy coating, which helps to prevent scale damage due to corrosion. This is significantly different than most of our competitors whose protective coating isn’t much more than a basic hardware paint. Our zinc epoxy adds an additional layer of protection that makes it much more difficult for the platform to become scratched. In the event that the platform does become scratched, which is bound to happen with any scale, our galvanized resin helps contain the scratch to prevent rust and additional damage to the scale platform. Stainless Steel Load Cells—Our floor scales come standard with stainless steel load cells, which allow our products to stand up to the harsh chemicals and materials that are common in the waste management and collection industries. Stainless steel load cells are far superior to aluminum, or other inferior metals used by other scale manufacturers. All of our stainless steel load cells are manufactured in-house, where we’ve been able to perfect our technology. For added protection, we recess our load cells inside the scale platforms to guard them against chemicals and materials that could cause damage. Ethernet – Using Ethernet, scale owners are able to access their scales over their Local Area Network (LAN). Our scales can either be accessed over a physical Ethernet connection, or over a wireless network using our Remote Indicator Software. This software allows you to control and analyze weight data from any computer, assuming that you have an internet connection. USB – If you have a computer located close to your scale, you can simply run a USB cable between the two and use our free USB Remote Software to control your scale. This is a convenient option for those with a scale that is in close proximity to their computer. Datalogging – Using the scale’s USB port, users can also connect a USB flash drive directly to the scale to download weight data. This data can then be accessed when a PC is available. Our scales generate a CSV file, which is easily readable by a variety of database and spreadsheet programs such as Microsoft Access or Excel. Set point controller – One of our most innovate features is our set point controller. This functionality allows users to set predetermined weight values that when triggered can control various pieces of equipment. Many of our customers use this functionality to control the loading and unloading of various materials. Interested in Learning More About our Line of Waste Management Scales? If you’re interested in learning more about the features that are available with our Arlyn 5200 Floor Scales, feel free to reach out to our team today by phone at 800-645-4301, or through our online contact form.